Last summer, when we went on our annual two week camping trip to Colorado, I really tried to document our Camping Menus. We are always so hungry at camp from hiking and being outside, so the food is one of our favorite parts! 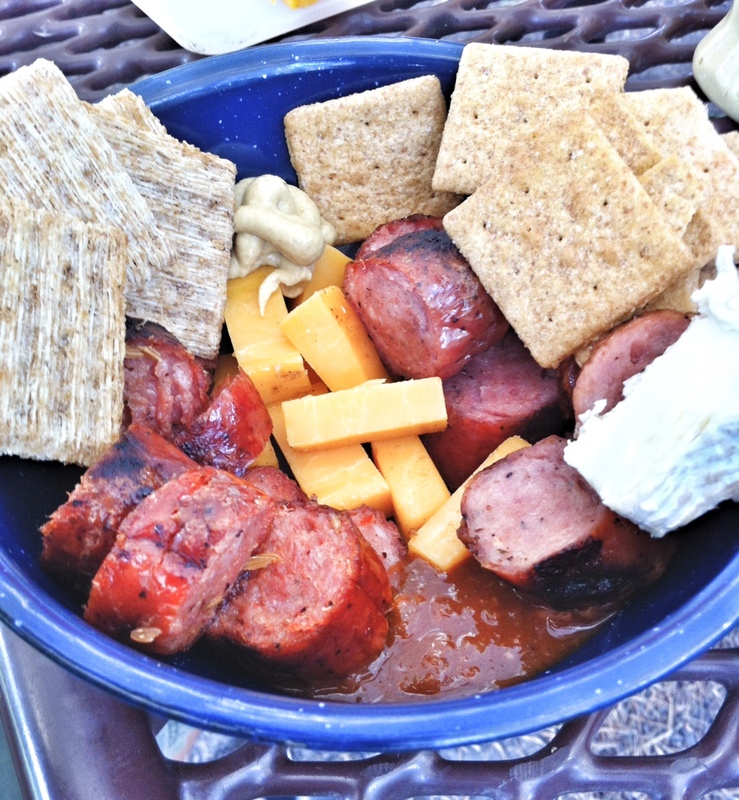 This first picture is a standard lunch meal for us: a little canned vegetarian chili with grilled summer sausage, crackers, brie and cheddar cheese and a generous spot of Dijon mustard. We usually cook hot breakfasts and dinners, and then we eat sandwiches or other cold, picnic items for lunch. Here are a few of our favorite camp meals! Bagels travel better than bread, as they don’t tend to squish in the box quite as much. Plus of course, sausage and eggs are a staple camp breakfast! Dinner: Pasta Carbonara and Grilled Asparagus. This creamy pasta with bacon is so yummy and it’s easy to throw together. I think all veggies taste better grilled, especially if your griddle is already all salty and greasy from cooking bacon. A little grime on your griddle is just part of camp life. Add a little red wine and breadsticks and this one feels like a fancy camp dinner! Drain pasta and then put it back in the pot, return pot to stove on low heat. Add butter, stir until the butter is melted and pasta is all coated with butter. Beat egg and cream together in a small bowl or glass with a fork. Pour cream and egg mixture over the pasta and stir until it thoroughly coats the pasta. Season with coarsely ground pepper. We mix our dry ingredients at home in a ziplock bag instead of buying pancake mix, which makes our camp pancakes so much yummier! Scoop 1/4 cup batter into skillet or onto griddle. Cook for 2-3 minutes. Flip. Cook one more minute. Serve. Buy a pound of pasta and a jar of your favorite sauce. Grab a little Parmesan to throw on your arugula (which keeps well if fresh) and spaghetti. Bonus: bread with cheese. Again, this is pretty standard fare. But later in the week when your bread is gone, your potatoes are still good in the camp box. Chop them small and fry them up. So good. Dinner: Cheddar Potato Soup and S’mores, Of Course! The big bag of potatoes you used just a couple of this morning gets peeled and sliced completely for this very flavorful and hearty soup which includes in the recipe a full-bodied beer. If you buy six bottles, you still have plenty left to drink with your soup. Finish with S’mores which we actually eat almost every night while camping! After a few mornings of eggs and meat, you need a healthy breakfast! This one is my favorite. Mix all ingredients except fruit in large bowl. Spread granola on a parchment lined half sheet pan. Granola should not be more than one inch thick. Bake at 325 degrees for 30 minutes, stirring every ten minutes. Toss in the fruit and cook about 5 more minutes. Allow to cool completely before storing in air-tight container. Enjoy! Camp Dinner: Pasta with Shrimp, Butter and Lots of Parmesan and Lemon. This is not even a recipe. If you put butter, garlic, lemon in a skillet with shrimp, you could pour it over freshly cut grass and it would taste good. Seriously. We’re getting lazy here. It’s the end of the week. We didn’t even take a picture. Oatmeal with a little honey, cinnamon and nuts goes great with a Colorado morning though, especially if someone brings it to you while you are still in your sleeping bag. We might have heat up the beans for these and warmed the extra large tortillas on the griddle, but other than that we used salsa, cheese, tomatoes, avocados and raw onions for a Make-Your-Own-Burrito dinner. Taido marinates flank steak in a combination of fresh ginger, sesame oil, olive oil and soy sauce. Grilled and sliced, it is probably the kids’ favorite dinner. We had these veggies on the side cooked in the skillet with butter and oil. We carry nuts and trail mixes of all kinds on our hikes. Plus carrots and popcorn (popped at home and carried in an old extra large Animal Cracker bin). I really love snacks, so I throw lots of extras in the cart when we shop for camping! What are your favorite camp meals and snacks? Are you so much hungrier when you go camping? Did you enjoy this post ? Maybe you’d like to subscribe to the Chino House via RSS feed or by email. More camping menus here. More about camping here. More recipes here. Follow our camping, hiking and travel adventures on Instagram! Camping is not my thing, but MAYBE if we had food like this…. Awesome post, Alison! Thanks, Amy! Good food really does make camping twice as fun! I just LOVE reading all your posts. What beautiful pictures! It makes me want to go camping! Thanks so much Debbie! I’m ready for warm, spring camping weather so we can get out there! You are VERY inspiring!! Thanks for sharing… my 3 three-year-old little girls will appreciate it! That is very kind! Happy camping to you and your family! What is your recipe for the first meal pictured on the page? There are crackers and cheese in it and I’m wondering what else? Hi! I found you through Pinterest and I love, love, love your camping menus. Your meals looks so healthy and delicious; thank you for sharing them. Could you please tell me how you pack your perishable like meat, eggs and yogurt for camping. I’m always so reluctant to bring these types of foods with us because I can’t seem to keep them cold long enough. Also, do you do a lot of your food preparation at home or at the campsite? Thank you! Karya, Thanks so much! We do love to eat well while we’re camping! Those are GREAT questions and I have really been meaning to do a “camping prep” guide for YEARS to answer questions like these. YES. We do a lot of prep before we leave home. It just makes things easier on the trail. My dad used to freeze milk jugs full of water and then put them in the ice chests to keep them cold for longer. Blocks of ice keep things cold longer. Also, we crack our eggs through a funnel into a bottle, shake it up (to scramble them) and then freeze it. Then you let it thaw while you’re camping and just pour as much as you need in the skillet each day for scrambled eggs. We also freeze meat ahead of time. In some cases (chicken fajitas), we even cook the meat, chop it and freeze it ready to use. We do tend to do our meat heavy meals at the front of the week and eat beans and rice later in the week. Summer sausage and bacon keeps a long time though. Anything that needs to be mixed up (pancake mix or even soup mix) we do ahead of time at home. For potato soup, I chop all the onions, potatoes and freeze it ahead of time. You can even add the spices you want in a freezer bag of veggies for soup. It lasts us about a week, so if we are camping for longer than that, we restock for the second week with foods that I don’t prep at home. I do usually freeze anything that can be frozen ahead of time (yogurt, meats, eggs, even milk). I freeze just the amounts we need in different size bottles/tupperwares/etc. We just drink water usually so we would need a second ice chest if we were trying to ice down drinks. Thank you!! Great tips, great blog!